Freezers and refrigerators are essential appliances for every household. It keeps the food fresh and serves as the perfect cold storage option. Things start to get ugly when your reliable cooling unit malfunctions. Besides not providing an optimal level of food storage, your faulty unit starts to make strange noises and consumes more energy than it should. All these issues cause lots of inconveniences, thus leaving you at the mercy of a professional fridge repairer to fix it properly. But finding a competent fridge mechanic presents another kind of problem. There are so many in the market that knowing which one is truly trustworthy, can be confusing. Fret not, mate. When sorting out a notable and licensed fridge repairer in your region, be sure to invigilate them using these questions. Top-quality fridge repairers will always adhere to the industry guidelines when serving their clients. This license guarantees the expert’s credibility to provide optimal fridge repair/maintenance services always. Mechanics without any legitimate license should not be entrusted with the task of fixing your cooling unit. It only makes you vulnerable to dodgy work. 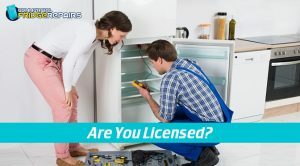 Why go for such unnecessary hassle when you can contact licensed and experienced fridge experts from “Commercial Fridge Repairs” and request for their services. It only takes one call, and with that our proficient professionals will come to your place, inspect your unit and perform the necessary repair or maintenance work needed for its smooth functioning. Every commercial refrigeration mechanic we send to help you uses the latest material parts, tools and approaches to surpass your expectations. Asking this question only presents peace-of-mind to you. By summoning licensed repairers; you save from yourself from extra expenses in the event of any accident, damage or injury. 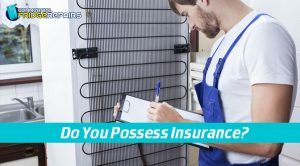 Furthermore, if you come across fridge repair experts with proper insurance coverage, it also testifies their skills to complete tasks promptly and without compromising on the work quality. 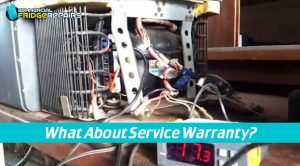 One hallmark of quality and experienced fridge repairer is- they always provide warranty on whatever services they offer. It reveals their confidence in their work quality and its ability to last a considerable length of time. Service warranties differ among different repair agencies. And so, the clever thing would be to check with them before finalising any deals. While you do examine their warranty periods; you should also check if they provide same-day repairs or not. This helps, especially if the repair work needs to be done on an urgent basis. Can You Share Some Customer References That Supports Your Claim Of Quality Service? 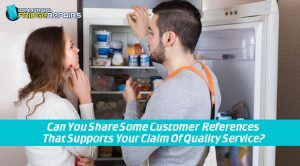 Lastly; you should never shy away from asking your shortlisted commercial refrigerator repair company to share references of their recently served customers. By receiving those contact details; you can call them and speak to them about how they felt after taking up their repair/maintenance services. Note- If your chosen service provider refuses or hesitates in sharing their client references, simply skip over to the next-best-option. 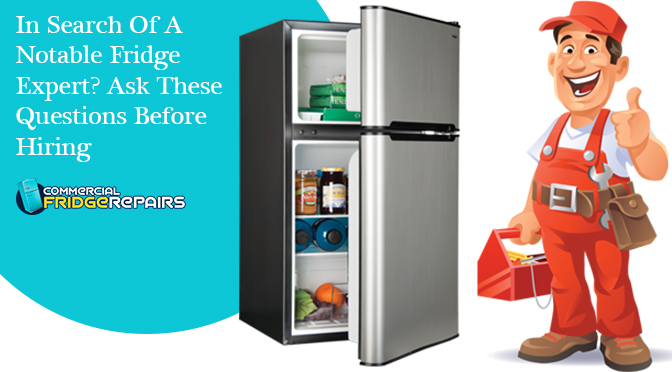 Our experts at “Commercial Fridge Repairs” will be more than eager to answer whatever questions you ask of them. The same goes if you seek any key information which only proves their professionalism, authenticity and credibility. Feel free to communicate with them about your refrigerator issue. If you have anything else to ask besides the aforementioned questions; you can do that too without any hesitation. Our experts strive for quality work, and hiring them will be the best result for your malfunctioned cooling unit. Why are you still waiting? Begin your search immediately!